This activity is designed to be used in pairs or groups. The instructions below are written for one pair. You will need to increase the amount of copies depending on how many pairs you have. 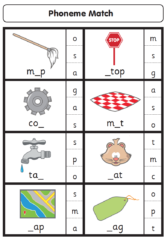 Download and print the Grapheme Match Cards. Cut out each card – you should have 36 cards. Laminate your cards if you wish to use it as a repeated activity. Divide the class into pairs or small groups. Give each pair a stack of cards and a bucket of laundry pegs. Place the cards in a pile on the floor between the pair. Taking turns, each child must recognise the picture on the card e.g. “mop”, then spell the word, filling in the blank with one of the grapheme options on the right side of the card. Have the child clip a peg on the correct grapheme. Continue this until the pile is finished.